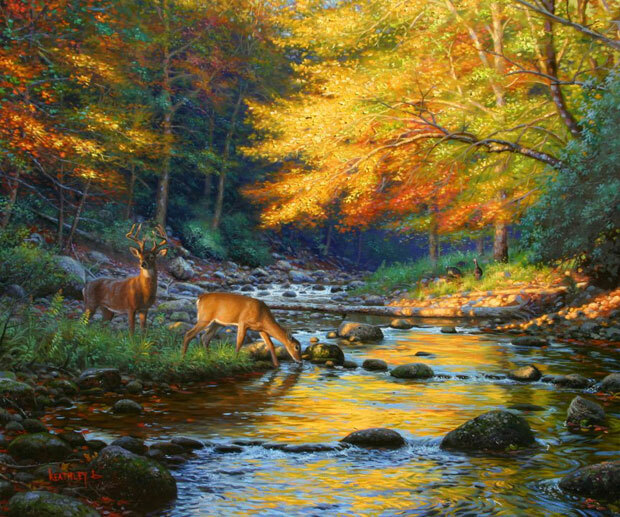 Mark Keathley (born 1963) grew up on the family cattle farm in East Texas and loved romping through the woods and across open fields. He spent most of his spare time outside chasing lizards, and trying to catch that illusive grand-daddy large mouth bass. It was here in this environment, where he first spied his mother's oil painting box in the attic of his country home. He had drawn pictures voraciously since age five, but the paints offered a new challenge that he thought he was up for at age eleven. After a very disappointing start, he didn't give up, and continued trying, often painting well into the night as a teen. He later attended a small one man show put on for a friend in his college art class and saw, for the first time, someone selling artwork. This was all it took. His renewed interest in painting and determination to learn more, kept him busy twelve to fourteen hours a day, six days a week, and within a year found that many folks were beginning to collect his work. "You're so young!" they would say, for he was twenty or so, and his career had begun. In the early 1990's, he entered a couple of paintings in the Cheyenne, Wyoming "Old West Museum Show" and won a couple of awards for his work. He also attended the "Texas Ranger Hall of Fame Art Show" in Waco Texas and twice won the "Popular Vote Award" for a couple of his pieces two years in a row. Everywhere he has gone, he has found great acceptance for his work, and his paintings hang in many homes around the world. Mark's favorite collectors are those who see his work, and want to take it home because it causes them to rest. "We are too busy these days," he says, speaking about our need to slow down, and to sit and think about life. "Our kids are growing up alone, our schedules are jammed full, and there is no time to contemplate what life should be about. I want my paintings to inspire people to be still, to listen to that quiet voice, and then rise up assured that they are a part of something bigger than their schedule." Mark's paintings do just that. He is able to capture that perfect moment that you might experience on a hike through the mountains when a majestic elk came out for an unforgettable experience. Or a moment in time when the light, the water, and the gentle involvement of a man and his horse all came together in a masterful composition. 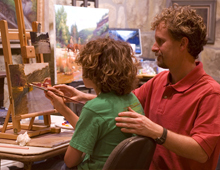 He is able to blend bold strokes of color and fine detail to bring your focus in to the most important areas, and give you the feeling that you are there. And that is where he wants you to stay - not admiring his ability, but rather inspired to live. 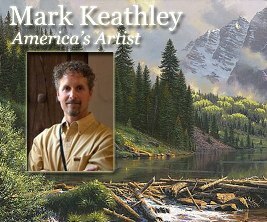 The painting, Faithful Friend, says a lot about Mark Keathley and where he gets his inspiration. 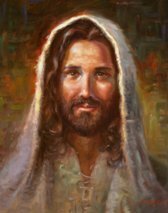 From his desire to depict the "Faithful Friend" he knows, Mark painted this portrait of Jesus with a kind look in his eye and a smile on his face -- the loving look one would see if someone really cared for you. In a day when we rarely slow down enough to gaze in each others eyes with a connection of souls that cannot be "said", this timeless work captures the "look" that we are all waiting for. The one that says, "I delight and approve of you". "The look I captured in Faithful Friend, is the look I want to see on Jesus' face when I meet him one day. My faith in all He is in me and through me gives me confidence that I will indeed, meet him with the delight of a best friend."